Delicious gently fruity unoaked wine with a lovely texture, a fine minerality and an excellent finish. The perfect aperitif, or with salmon in a herby butter sauce. White Beaujolais, once a rarity, is becoming easier to find in this country. 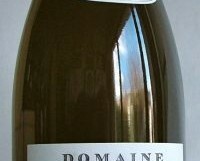 The best examples combine a lovely freshness, a minerality and delicate pure Chardonnay fruits. I have recommended the Jean Paul Brun Terres Dorées before. It is available from Wines Direct. Domaine des Nugues makes some excellent, classic (in a good sense) red Beaujolais, elegant and balanced; his white is every bit as good. €17.30 from Martins, Fairview; 64 Wine, Glasthule.